Need breakfast recipes for your next camping trip? These easy breakfast recipes are too delicious for you not to try next. Whether you are preparing your ingredients beforehand or starting from scratch on-site, take your camping experience to the next level with these breakfast recipes. Nothing will get your kids out of their tents faster than the smell of campfire bacon or orange cinnamon rolls! For the most important meal of the day, you'll want nothing less, so keep scrolling for all 25 camping breakfast recipes! Breakfast Recipes To Fire Up Your Appetite For Adventure! You'll enjoy this easy hodgepodge of a recipe for your camp breakfast. Potatoes, sausages, and corn make up this filling meal to start your day! Make room for a pie iron in your camp essentials. It will be very handy for quick and easy breakfast recipes like this strawberry and Nutella sandwich. Ready for the week! #breakfastburritos for days! One: Cook potatoes and brown sausages. Two: Scramble eggs and add cut potatoes and sausages. Three: Wrap mixture in tortillas and it's ready to eat! With this easy breakfast burrito recipe, you are good for the day. It doesn't take up that much space, so might as well bring a biscuit pan to whip up one of your camping breakfast recipes. Eggs, biscuits, and this savory burger patty recipe will cook quick and easy! Who says only bacon and eggs make a good breakfast? Healthy breakfast recipes also come with fresh fruit. Give this healthy and delicious fruit and yogurt in cones a try and you'll see breakfast in a different light! You can count on the authorities on camping to give us the perfect outdoors breakfast recipe. Give this mountain man breakfast a try and cook it over the campfire in a good cast iron skillet. 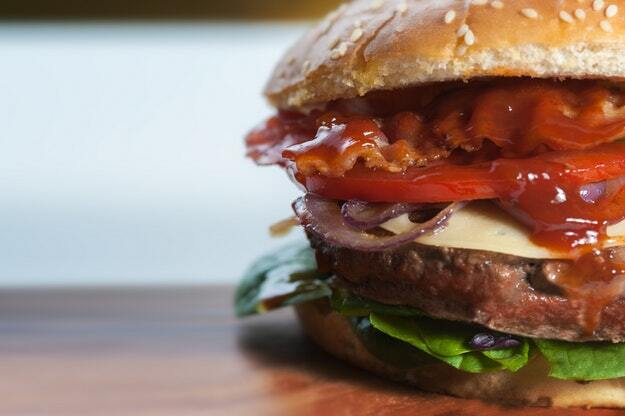 Not in the mood for a breakfast burger? Perhaps a bacon and egg breakfast sandwich is more your thing. It's a bit tricky to cook this pancake recipe with a custardy consistency in a Dutch oven. But for a delightful breakfast, you'll be more than willing to rise up the challenge! Bacon and eggs practically spell breakfast. But add cheese and tortillas and what you have is a delicious and filling breakfast quesadilla. Watch your family's reaction as you serve up pieces of this Dutch oven bacon-pull apart. They will be wide-eyed with lips smacking–exactly the effect this recipe will generate! 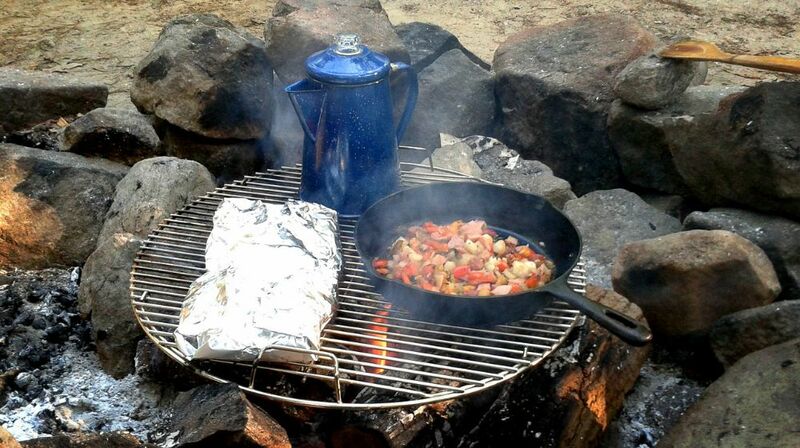 Foil-wrapped camping recipes are great for easy clean-up after a camp meal. So why should breakfast be any different? Try this potato sausage foil pack you can easily prepare and clean up after. We've quite a number of breakfast hash recipes here but instead of sausages, we add good old bacon to the mix. In as quick as 30 minutes, you have one breakfast recipe ready for your little campers to wake up to. Make all your camping breakfast recipes better with bacon cooked over the campfire. You can either grill bacon and serve it as bacon barbecue. Or, you can wrap it in tin foil and let it cook in its own fat. Yum! Have this meal packet for breakfast, and you'll be ready to face whatever the outdoors has in store for you. Meet the sunrise to the smell of fried bacon and ham cooking over the campfire. Smother this farmer's breakfast skillet with melted cheese for a satisfying first meal of the day. In the tradition of marshmallows roasting over a campfire, we give you the cowhorn biscuits. It's a fun food cooking technique–a camping signature. A good 15 minutes and a Dutch oven are all you need to make this yummy breakfast treat happen. Check out this recipe for one of the best cinnamon rolls you'll ever taste. Potatoes are such dependable staples, especially for outdoor meals. They make great sides for breakfast, lunch, and dinner. Take this bangin' breakfast potato recipe and love good old taters even more! Your camping trip might lead you to a bumper crop of wild blueberries. They're best eaten right off the bush, but you might want to bring more back to your camp for this cinnamon blueberry bread recipe. Give your pancake recipe an upgrade with beer. Butter and maple syrup on top with a side of fried bacon will fire up your appetite for adventure for sure. If you love French toast, this recipe will be your new favorite. With your pie iron, breakfast in the woods will be ready in a jiffy. For a truly quick and easy breakfast recipe out in the wild, nothing beats roasted corn. While other breakfast recipes are cooking, simply slide foil-wrapped corn over the hot coals. Add butter once cooked and enjoy! You may have to wake up an hour early to prepare this breakfast recipe, but your family will love you for this! Anyone who loves camping will not back down from this delicious recipe. This omelet recipe is best made on the campfire. The smoke will add an extra flavor along with the herbs and seasoning. It's easy to take out camp meals or use canned and preserved food, but it's way cooler to make and cook them yourself. Meals you prepare from scratch are certainly more appetizing–and make your outdoor experience even better. Enjoy your camping trip and start your everyday adventure with delicious breakfast recipes you can cook and prepare for the family. We hope you enjoyed these amazing camping breakfast recipes! Try them out on your next adventure and let us know how it goes. You can share your wonderful stories in the comments section! Editor’s Note: This post was originally published on May 26, 2017, and has been updated for quality and relevancy. For a healthy diet please visit HCG Injections a review site that’s all about helping you choose the perfect injections to meet your needs. Yummy! Nice list of delicious recipes.